Rick Raether, nicknamed "Spiderman" for his 6 foot 5 inch, 184 pound frame, was perhaps the best relief pitcher to set foot on the mound for the Hurricanes. During his two-year stint as the Canes bullpen ace in 1985 and 1986, Rick set an NCAA Division 1 record for career saves with 37. The sidearm hurler also established himself in the Hurricane record book setting the record for for career saves with 37, finishing second with saves in a season with 20 (1985), and third with 17 (1986). In his two seasons, Rick won a College World Series Championship ring in 1985 and earned first-team All-American honors in 1986. He was chosen Baseball America All-American and team MVP both seasons, as well as ABCA Atlantic Regional All-Star in 1986. He was a fan favorite and was awarded the Arnold Novins Memorial Award in 1986, given to the most popular player and voted on by the fans. 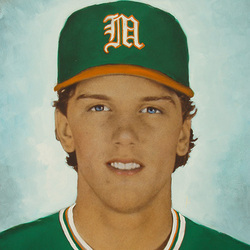 Rick was dreafted by the Texas Rangers in 1986 and was traded to the Monteral Exos in 1988 and enjoyed a very successful professional career.